For a broader coverage related to this topic, see Deviation. Note that the sum of the residuals within a random sample is necessarily zero, and thus the residuals are necessarily not independent. The statistical errors on the other hand are independent, and their sum within the random sample is almost surely not zero. which is generally called t-statistic. However, a terminological difference arises in the expression mean squared error (MSE). 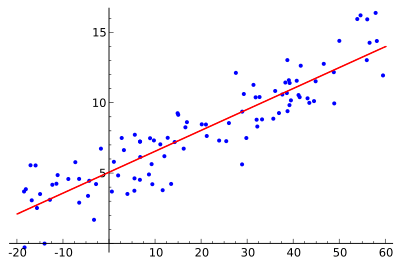 The mean squared error of a regression is a number computed from the sum of squares of the computed residuals, and not of the unobservable errors. If that sum of squares is divided by n, the number of observations, the result is the mean of the squared residuals. Since this is a biased estimate of the variance of the unobserved errors, the bias is removed by multiplying the mean of the squared residuals by n - df where df is the number of degrees of freedom (n minus the number of parameters being estimated). This latter formula serves as an unbiased estimate of the variance of the unobserved errors, and is called the mean squared error. Another method to calculate the mean square of error when analyzing the variance of linear regression using a technique like that used in ANOVA (they are the same because ANOVA is a type of regression), the sum of squares of the residuals (aka sum of squares of the error) is divided by the degrees of freedom (where the degrees of freedom equals n-p-1, where p is the number of 'parameters' or predictors used in the model (i.e. 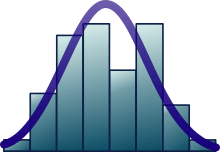 the number of variables in the regression equation). One can then also calculate the mean square of the model by dividing the sum of squares of the model minus the degrees of freedom, which is just the number of parameters. Then the F value can be calculated by divided MS(model) by MS(error), and we can then determine significance (which is why you want the mean squares to begin with.). Cook, R. Dennis; Weisberg, Sanford (1982). Residuals and Influence in Regression. (Repr. ed.). New York: Chapman and Hall. ISBN 041224280X. Retrieved 23 February 2013.